bybmg: Hot Dog, Hot Dog, Hot Diggity Dog! 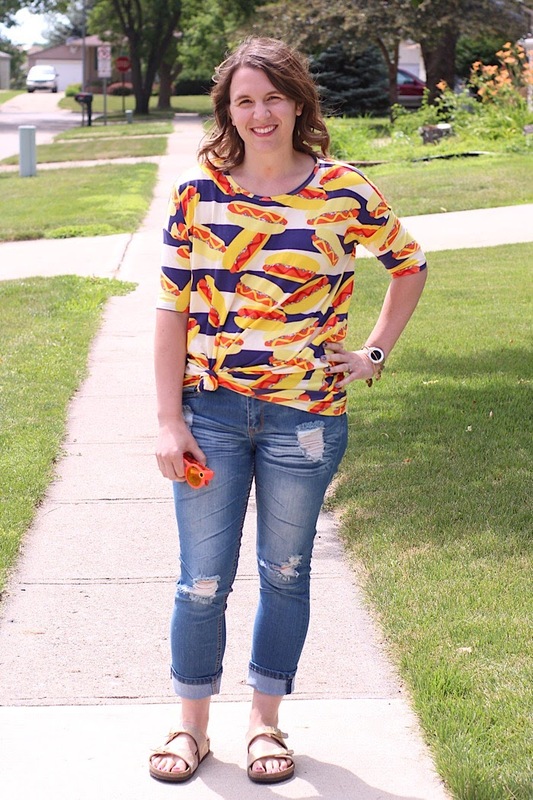 This week, the How I Style It ladies (Della, Nicole and Tif) are styling some novelty prints. It's always nice to have a piece of clothing in your wardrobe that is just plain FUN, and today's top is just that for me! 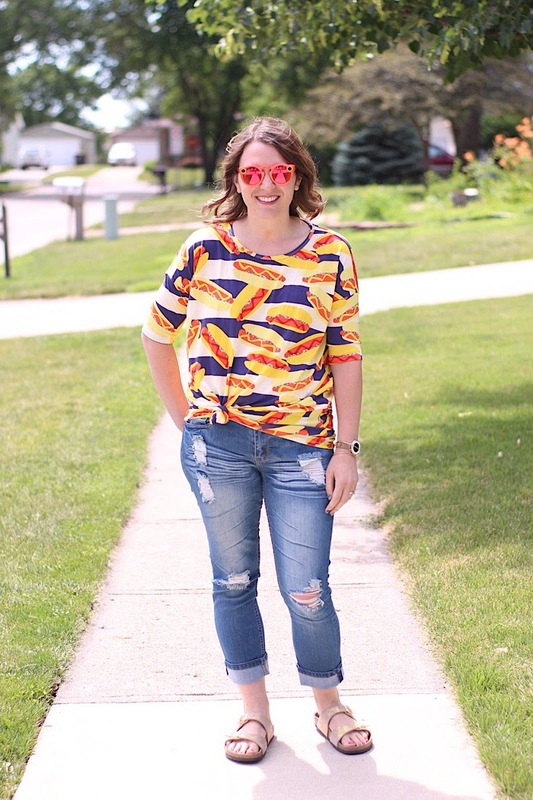 When I saw that LuLaRoe was releasing Americana prints earlier this summer, I was intrigued! 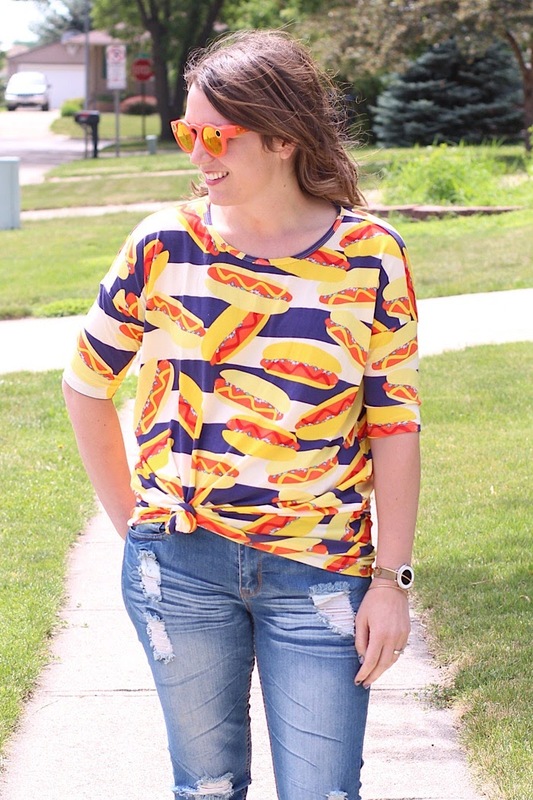 When I saw this hot dog pattern, for some reason I was obsessed! I was even more excited when one of my local reps had one in her live sale! I snagged it and it was PERFECT to wear to the ball park! Hot dogs and baseball just go together, don't you think? This is a LuLaRoe Irma top, which is typically worn tunic-style with leggings, but I knotted it and paired it with my "new" distressed crops for the ball game. 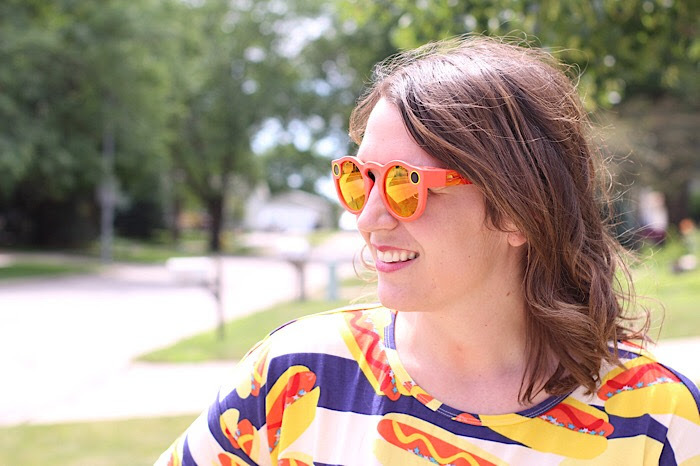 I stuck with my comfy Birks because we'd be walking a lot at the ball park and added my fun shades to complete the look. I've been wearing my Snapchat Spectacles a lot this summer because it's great to push a button and capture a video of what we're doing instead of having to pull my phone out of my pocket or purse! And the bright color of them is totally fun, too! The print from this top may be hard to find, but shop around with your LuLaRoe gals and you might find it. I have linked up some other fun prints like strawberries and pineapples below. I love novelty prints! What is your favorite? Now hop over and check out the other ladies' looks! 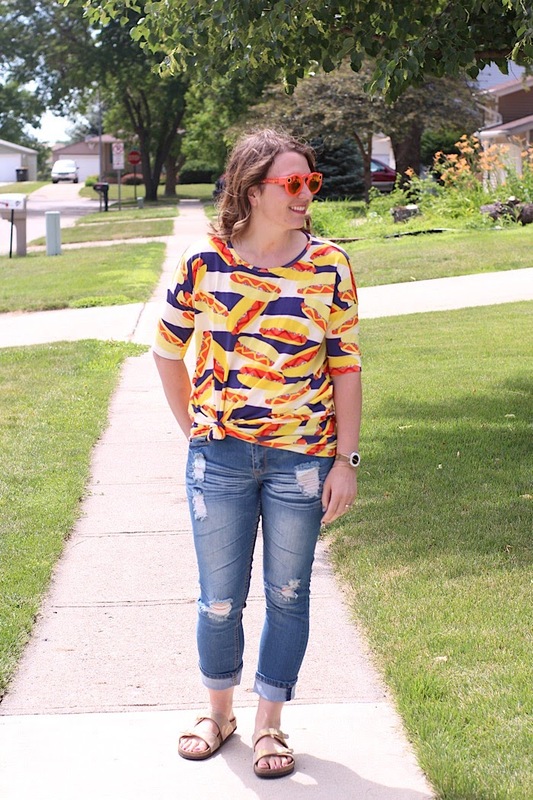 I'm linking up with Shelbee, The Blended Blog, The Pleated Poppy, Jersey Girl Texan Heart, Thursday Fashion Files, and Pumps and Pushups, Elegance and Mommyhood.